Belarus had a population of 9,498,700 in 2016, and one that is largely urbanized. Over 80% of the population is ethnically Belarusian. People in traditional garb demonstrate 18th century craftsmanship in Belarus. According to 201 figures, Belarus has a population of 9,498,700 and over 70% of the population resides in urban areas. More than 80% are Belarusian with minorities such as Russians, Polish, and Ukrainians. They speak the two official languages of Belarusian and Russian. Belarusian is the primary language spoken by 72% of the population and Russian, the second official language, is spoken by 12% of the people. Although the constitution does not declare a state religion, Belarusians mainly practice Orthodox Christianity, followed by the Roman Catholicism. Belarus, like many other European nations, has a negative growth rate of 0.4% per year, with a fertility rate of 1.26%, which is below the replacement rate. It has a birth rate of 9.76%; boys for 5.03% and girls for 4.73%. Its 0.4% net migration rate indicates that it experiences more immigration than emigration. The infant mortality rate is 7.24 %, and the death rate is 13.4%. 83.7% of the population is Belarusians. Russians comprise 8.3% and a significant number of them having migrated into the country during the Second World War. Ethnic Poles account for 3.1 % of the population, majorly found in the western part of the country near the Polish border. 1.7 % is Ukrainians, and 2.4 % consist of other ethnic communities like Lithuanians, Latvians, and Tatars. Orthodox Christianity is the dominant religion in Belarus, with over 1000 churches in the country. Other minority religions in Belarus include Catholicism, the second most widespread religion with over 400 churches. Judaism is mainly for the Jews and has more than 40 Hebrew communities. Protestantism comprises of the Lutherans, Mormons, Baptist, and Calvinists. There are 27 Muslim communities and nine mosques in Belarusian and a minority number practicing neopaganism. Belarus has no state religion despite the fact that Orthodoxy is widely practiced. All the religious groups and communities practice their religion freely and peacefully. The constitution provides for freedom of worship in the country, although the government restricts this right in practice by prohibiting religious groups that it deems harmful to the government. 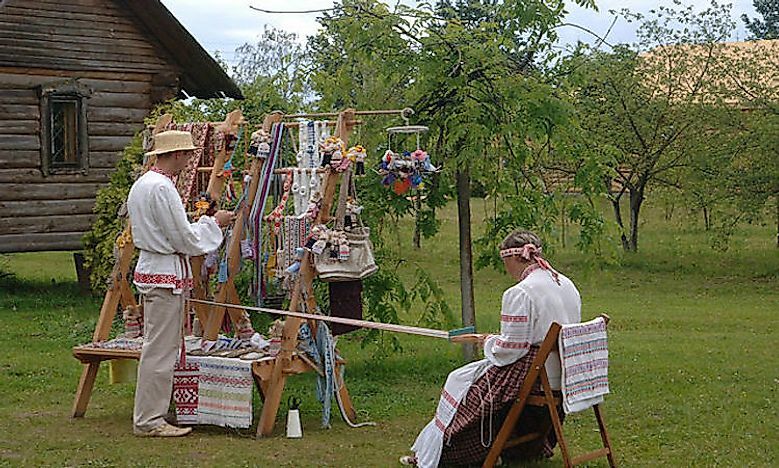 Belarusian culture is diverse in various traditions that incorporate attributes of the physical environment, their Belarusian ethnographic background, paganism of the early Belarusian settlers and Byzantine Christianity. All these aspects influence the art, Music Theater, and Literature environment in the country. Their art displays the Byzantine influence in illustrations of iconography and manuscripts. Music festivals are very popular among the Belarusians, and most of them can play at least one musical instrument. They enjoy a broad range of music including the modern day pop music while still holding on to their tradition folk and classical music. Belarusian literature is a national identity in the literary works of known poets like Yakub Kolas and Yanka Kupala. The tradition of the modern theater is strong with many professional theaters both public and private all over the country. Although the population of Belarus is diverse, it enjoys an integrated social cohesion and peaceful co-existence, and other bilateral relations with their neighboring countries. The Belarus population is also an aging population with an average life expectancy of 72 years. Over 99% of the Belarusians are literate, and more than four million people are working class, with women holding more jobs than men. The constitution protects the people through a legislation documenting human rights and freedoms.